Maybe you’ve seen the item on Valleywag. (If not, go here.) Well for once they’ve actually got something right. 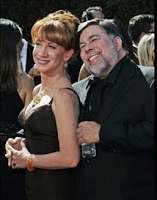 Woz is coming to my event at Kepler’s in Menlo Park tomorrow night. Jesus. I know he’s got a lot of free time on his hands, but still. What won’t the guy attend? Next thing you know he’ll be doing kids’ birthday parties and car dealership openings. Larry says I should be pissed because it’s yet another case of Woz trying to draft on my fame. Actually it’s worse than that. Truth is Kathy Griffin wants to meet me. I’ve seen this coming for a while. It’s happened before, more times than I care to admit. They use him to get to me. Know how we all wondered why she was dating him? Now the whole thing makes sense. Poor Woz, however, apparently has no idea. Anyhoo. Kepler’s tomorrow night. Fake Steve and Real Woz. And maybe Kathy G. Talk about a D list event. I can’t wait.